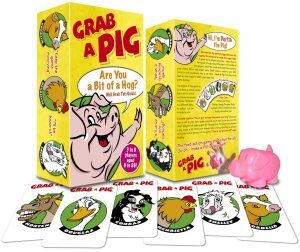 Grab a Pig is a card game made wholly in Great Britain in order to support British companies. The idea for the game came whilst playing games over Christmas in the year 2000; quickly we realised that the game would suit people from most age groups. We have many groups of adults who regularly play Grab a Pig; from young adults to older ones it is being enjoyed as an adult game around the world. The Grab a Pig card game requires you to lose 3 lives before you are out. This can be adjusted to have less or more lives if you wish to make the game shorter or longer. It is the flexible approach of the game that makes Grab a Pig so adaptable. Use this flexibility to perform tasks; lose a life, take a drink, perform a dare or do a forfeit … you get the picture. Grab a Pig can be flexible as your imagination. For a perfect night of fun, add the Grab a Pig card game and a group of fun loving, open minded adults. We guarantee you will have fun once you enter into the spirit of the game. If you want a game that is fun for adults to play at parties, pre or post nights out or to use as an ice breaker with friends then try Grab a Pig. Take it with you to a stag or hen party, dinner party or anywhere that you plan to gather with a group of fun loving adults.